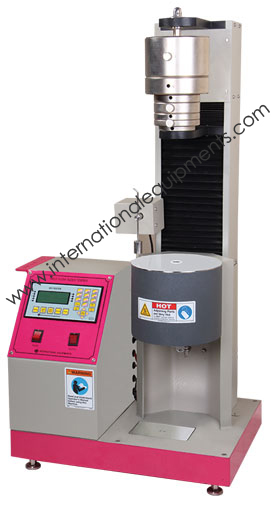 Melt Flow Index Tester as per ASTM D – 1238 to measure the flow rates of thermoplastics by extrusion plastometer. This test indicates the uniformity of the flow rate of the polymer. to 400ºC, resolution of 0.1ºC and accuracy of + 0.1ºC. Weights : 1.2 kg, 2.16 kg, 3.8 kg, 5 kg & 21.6 kg. ambient to 375ºC, resolution of 0.1ºC and accuracy of + 0.1ºC. Micro processor based auto tuned PID controller with temperature range from ambient to 400ºC, resolution of 0.1ºC and accuracy of + 0.1ºC.